My first job in education was at a small rural high school district. I was their first full time “IT Guy”. And when I say full time, I’m stretching a bit, as I was actually farmed out to one of the feeder elementary schools for 2 days a week. Prior to my arrival, they had been contracting with a local tech services company for their onsite break/fix tech needs. The high school district was fortunate enough to recognize that to make forward progress with technology, they had to make a change. So there I was, fresh off a year of doing HA (High Availability) distributed cluster design/support for a Software as a Service (SaS) start up, thrown backwards in time, supporting 4 schools in two districts whose prior tech strategy had been “keep those eight year old computers running indefinitely”. By the time I left in 2011, the high school district was going 1:1 and the elementary districts realized they needed full time support too if they were going to move into the 20th century (much less the 21st). Unfortunately for small rural school districts, finding competent tech support is still a challenge. While local IT services companies may do an ok job of break/fix, contracting with them is a ticket to status quo at best and sometimes serious frustration at worst. Local IT service companies tend to be business focused, just like school IT shops of old, and are not well versed in the unique edtech challenges facing classrooms today. They also tend to struggle with basic services in schools, like wifi, because frankly they don’t often have the skill set or experience needed to provide services beyond “small business”. Every school district, no matter how small, will outgrow the “business” IT support contract model as they move towards 1:1 student centered learning. The main reason: the shift towards authentic technology integration into everyday instruction is happening right now. The demands of this type of learning environment cannot be met with traditional outsourced business focused IT support. Successful implementation of technology integration requires new ways of thinking and looking at what is really needed to provide tech services to the classroom. Mike Vollmert and I have been helping a small, one school, district do just that over the past year. How do we get reliable bandwidth at a decent rate? In California, the best way to approach this is to work with the County Office of Education (COE) on getting the most bandwidth a district can afford/qualify for. Wether it be wireless microwave or dark fiber, districts should get enough bandwidth for now and the future, while making sure either the ISP or the COE is responsible for supporting it. District’s don’t want to be messing around with routers and need a single point of contact to call in the event “the Internet” stops working. For our small district, we eliminated a network bottleneck that had been overlooked by the local IT service contractor. In doing so, we doubled the bandwidth available to the district. We are now working on an e-rate application to double it again. The district uses the COE’s firewall for perimeter network security and works closely with them on troubleshooting ISP connectivity. Just a few years ago, you needed to be a networking expert with real skills to provide for a robust wireless network that could support multiple devices per user. School networks were often overly complex and over engineered. Today, complexity in the network is not your friend. The network for most small school districts should be a simple star topology with one smart switch and a lot of dumb ports. The key is good fiber between buildings and good cable into the classrooms for the Access Points. Running good cable up front will save tons of issues down the road. I’ve seen too many districts spend a ton of money on expensive networking equipment and advanced feature sets they did not need only to plug it in to “net day” grade wiring with disastrous results. Overspending on hardware is another symptom of a dysfunctional support system where the people designing the network and recommending the equipment to buy are also the ones selling it and installing it. With our small district, we went a different route. 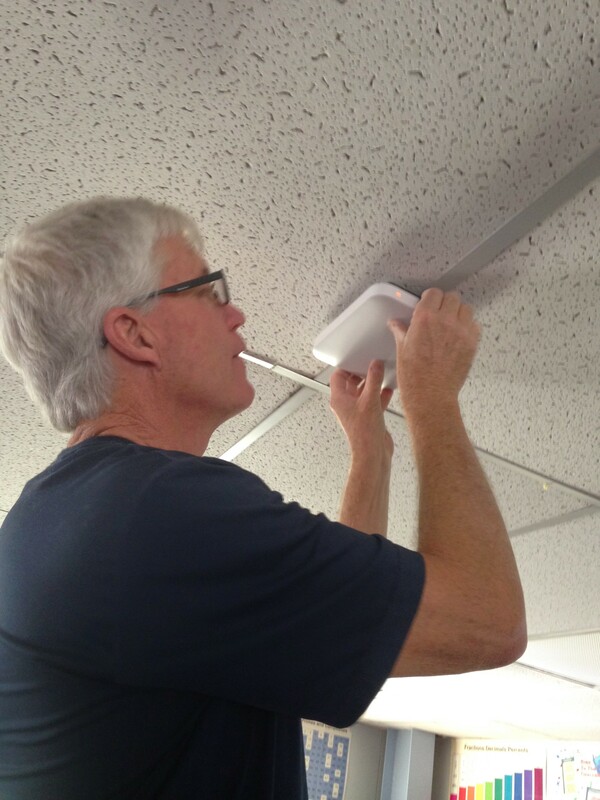 We installed a Meraki Access Point in every classroom. Now day to day wireless network management is handled by an enthusiastic “techie teacher” who had all of 30 minutes of training with the dashboard. Thanks to the simplification of network management that Meraki brings to the table, the teacher was easily able to setup SSIDs for an edtech event hosted at the school for over 100 educators. For a school that usually only has 180 students and a dozen teachers on campus, to be able to setup and run an edtech event with no wifi issues is a testament to how easy it has become to provide enterprise grade service without paying a fortune for support. Our next upgrade will include a Meraki switch in every IDF and over time, our techie teacher will continue to learn more about supporting the network from the dashboard. He’s always just a Google Hangout away from support if he needs it, but by reducing the complexity of the network down to a few key components, the level of troubleshooting required when things don’t work is greatly reduced. Because with limited support staff, there is no reason to run a local email server. Ever. For our small school, we moved all users off of AD and into Google Apps for Education. Every user can now be managed from the Google Apps Admin Panel. Adding/removing and changing accounts is easy. The only thing required is an Internet connection. Before we made this change, users were locked down on their desktops and complicated Active Directory settings made handing off account support to a teacher impossible. Google support is now just a phone call away if needed. Going Google is a no-brainer for a small district. One of the most difficult things to overcome when being serviced by an outside support vendor is the “lockdown”. Locking down systems makes support easier, because it limits what people can do to their computers and in a business environment that can wait a week for flash updates, it makes sense. However, in the classroom, where technology needs to work or it will become a barrier to learning instead of an accelerator, locked down may as well mean locked out. Teachers need control of their device. They need the freedom to install apps, run updates and use their devices at home, even if that means messing it up. Our small district was struggling with all of these challenges, so we removed all staff computers from the Active Directory domain and moved them to local admin accounts. Combined with migrating all of their file storage to their Google Apps for Education Drive account, we effectively eliminated the need for Active Directory in the district and gave teachers full control over their device, both at school and at home. Desktops don’t qualify as student devices. Computer labs don’t qualify as student devices. Virtual Desktops (VDI) do not qualify as student devices. Student devices are mobile, personal and available where and when students need them. There are a few options that work well with limited support. The most full featured option, but one that requires a leap of faith, is the ubermixed notebook. Ubermix is a linux operating system that provides a full featured computing environment that is so easy to deploy and support, any middle school student can learn how to do it in under 10 minutes. Ubermix has the added advantage of having local apps that will work without Internet access, a big consideration for many small, rural school districts where student access is a challenge. Of course chromebooks and iPads (or android tablets) are out there. I would advocate for any mobile device solution that put access into every student’s hands. However, for small and rural with limited support and home Internet access challenges, #ubermix wins, hands down. My goal is always to design for simple and self-sufficiency. Choosing solutions that have “enough” features, are easy to manage and can be supported with low-mid level skills is critical. Providing a “support in depth” strategy, from student tech helpers that can image ubermix laptops, to techie teachers that can do basic troubleshooting and be remote hands for onsite tasks, paired with knowledgable experts with advanced troubleshooting and school planning experience, provide a school focused, self-sufficient support model that cannot be matched by simply outsourcing to a traditional IT services company. Of all the areas where small schools have the biggest uphill challenge with integrating technology into their classrooms, professional development is it. The challenges of geographic isolation, funding and local resources are monumental. However, there is hope. I recently attended a fist annual edtech summit hosted in a very remote county in northern California (Go Siskiyou!). It was awesome. To see so many local educators come from across the geographically dispersed county for a day of edtech learning was incredible. It shows that where there is a will, there is a way. For small school districts, the key to growing edtech adoption in classrooms is making connections. The best way to do that in the beginning is to go to edTech events. Starting with traditional edtech conferences is good. Branching out in to non-tradtional (like edCamps) is better. The point is to go out and see and learn from what others are doing. For rural districts, it might mean a 6 hour drive but it will be worth it. Getting teachers excited about technology requires that they see what is possible with it. That’s a hard proposition in isolation. Connect, make new friends, continue the learning through twitter, Google Hangouts and the Internet. PD is an investment that pays dividends down the road. None of what I’ve listed above is a one and done deal. It all requires continuous reflection, ongoing care and feeding and a growth mindset. There will always be a need for more bandwidth, the wireless infrastructure will need to evolve to keep up with newer, faster devices. Student devices will wear out and become more trouble than they are worth to try and keep them running, teacher devices will need to be refreshed so that teachers can do what they need to without worrying about wether or not their computer will work when they need it, tech support needs will evolve with the environment, PD will need to be a continuous journey of learning, not a one stop shop, but Google Apps will be forever! Districts cannot afford to let their technology become static. A long range vision, paired with an evolving strategy and regular reflection will allow for adaptation and evolution. To sum all this up, small school districts have a tremendous opportunity to embrace the edtech revolution. The technology available today makes it possible to shift the support paradigm on it’s head and put the power of technology into the user’s hands. There is no reason why small school districts should not have the same educational technology learning opportunities for their students as big city districts do. We are disintermediating the traditional IT stack to move support down as close to the end user as possible. Just in time, where and when it is needed. Making the shift will take some vision, some strategy and a different way of thinking about IT support, but it can be done. I know because I’ve done it and it’s a sad day when I see a small district’s potential being stifled by outside consultants that don’t understand what technology in schools is all about. Of course all of this falls apart at scale where the trick is in seamlessly leveraging complexity to make everything appear to be simple and easy to manage. So you don’t manage any teacher devices. You trust them to run updates, install appropriate software, check for viruses and malware and remove accordingly. Yes, that’s one reason we run Macs. It’s much easier to give them local admin and not worry too much. If anything happens, we re-image. Docs are in the cloud with Google Apps so not too worried about data loss. It’s a light touch management environment that’s works. See that makes me quesy not having some type of control. We are deploying new laptops to teachers. They will be connected to AD, teachers will be admins of their machines. Mike Vollmert at Rio Schools runs Windows laptops with local admin and no AD for his teachers. I think they have a managed AV solution. But that’s it. Andrew, any chance for a phone call with a fellow “IT Guy” trying to support a tiny K-8 school? I stumbled across your blog while searching “Meraki vs Uqiquiti vs Ruckus vs Aerohive” and have been reading for close to 3 hours now :) I am a parent volunteer for my kids school for going on 8 years now. Solved many of the hurdles you list in this article (migrated the school to Google Apps many years ago, No AD at the school, moved out all of the servers, got rid of all PCs (fully Mac now) and so many others. My weakness is networking and with a full networking replacement (wired and wireless) on my plate, would so love to be able to speak to someone like you for some pointers! Any chance you might be up for an email or phone call, my email is listed on this reply. Also willing to hire you for advice, even for a few hours. Our school is located in Southern CA.